/Design Tools - Text /Can I align all text to the left? Yes, you can align text to the left, center, or right. While holding Shift on your keyboard, select all text boxes you want to modify. To change the paragraph style, click the Text Alignment icon located in the horizontal toolbar at the top of the page (see picture #1 below). 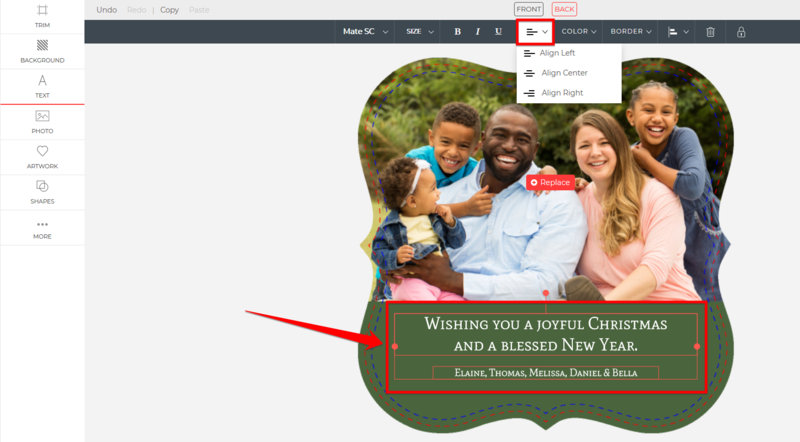 This will provide a drop-down with the following three formatting choices: Align Left, Align Center, and Align Right. Choose an alignment that works for you. This only affects the orientation of the text within the text box, not the position of the box itself. See 3 for that. If you have any questions on this process, please do not hesitate to contact our support team for assistance! Can I modify the text so it is bold or italic?